American writer Kate O’Flaherty (Chopin) was born on Friday, February 8, 1850 in St. Louis Missouri. This year (2019) is her 169th birthday. 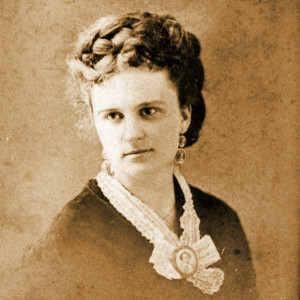 Experiencing the Civil War, the early stages of the Women’s Suffrage Movement, married life with six children, and that of a widow; she wrote two published novels, At Fault (1890) and The Awakening (1899), and two collections of short stories, Bayou Folk (1894) and A Night in Acadie (1897), as well as poems, nonfiction prose, and translations. In the United States the debate on slavery affecting the West was fully active the year Chopin was born, a debate that concluded with the “Compromise of 1850.” The second trial of Dred Scott and his wife had concluded with a temporary victory in St. Louis. The National Women’s rights Convention had met that year in Worcester, Massachusetts. The month of her birth saw the publication of Nathaniel Hawthorne’s The Scarlet Letter, Herman Melville’s White-Jacket, Ralph Waldo Emerson’s Representative Men, and Susan Warner’s The Wide, Wide World. The country’s population was 23,191 876. In St. Louis, Missouri, steamboats were becoming the major form of transportation on the Mississippi River. Large numbers of Germans and Irish were arriving, and the cholera epidemic of the year before resulted in all visitors to the city being required to pass through a permanent quarantine station. The second trial of the Scotts was on going, as the site of the city between Free and Slave states brought many legal petitions to the courts for slaves’ freedoms. In the month of Chopin’s birth, the poet Eugene Field was born. Abroad, in England The Germ, the PreRaphaelite periodical, was in its second month of publication when Chopin was born. Among the writers active then were Charles Dickens, Alfred Lord Tennyson, and Robert and Elizabeth Browning. In Europe, writers Alexandre Dumas, Henrik Ibsen, Ivan Turgenev, and Soren Kierkegaard were active. Musicians born in the 1850s included John Philip Sousa, Edward Elgar, Victor Herbert, and Giacomo Puccini. Among those whose music was being played then were Charles Gounod, Frederic Chopin, and Richard Wagner. Among artists born in the 1850s were Henry Tanner, George Singer Sargent, and Edward Wilson Currier. Artists active in the 1850s included John James Audubon, Asher Durand, James Whistler, and Rosa Bonheur. Although the actual year of Chopin’s birth was and still is often printed erroneously, Jean Bardot during his research for his dissertation on Chopin at the Sorbonne (University of Paris) found the difficult to find year, 1850. His note on the discovery was published in Xavier Review (Vol 7, No.1) in 1987. Since then, all authoritative biographies and studies have used 1850 as the year of Chopin’s birth.